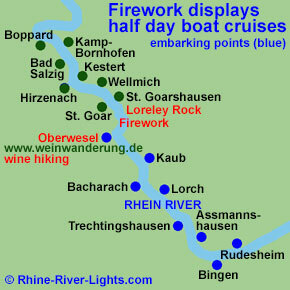 Discover the romantic Middle Rhine River in Germany from a completely new point of view with half day boat cruises. 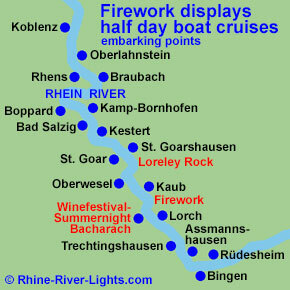 Enjoy a spectacular firework display during a boat trip in the Middle Rhine River Valley between Koblenz / Coblence, Lahnstein, Boppard, St. Goar, Loreley Rock, Oberwesel, Bacharach, Assmannshausen, Bingen and Rudesheim. The boat cruise with DJ music and dance on board is starting from different wine towns with wine hikings and wine festivals. along medieval castles, romantic wine towns and a picturesque landscape with board party, DJ music and dance to the Red wine festival in Assmannshausen. 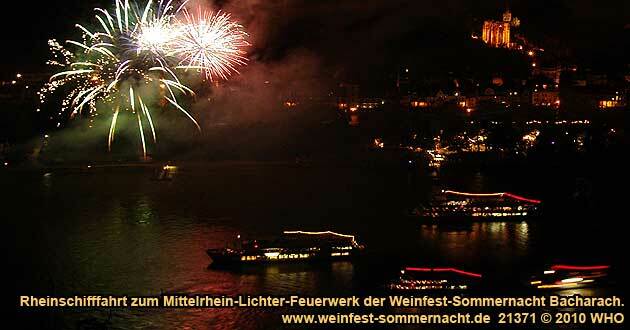 Wine booths with white wine and the famous red wine of Assmannshausen, food booths and live music on the Rhine River promenade. The musical firework can be seen from the open air deck. 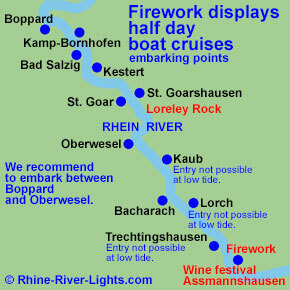 along medieval castles, romantic wine towns and a picturesque landscape with board party, DJ music and dance to the Wine festival summer night in Bacharach on the Rhine River shore with about 10 wine booths from winegrowers of the Middle Rhine River Valley, 1 beer booth, about 3 food booths and live music. 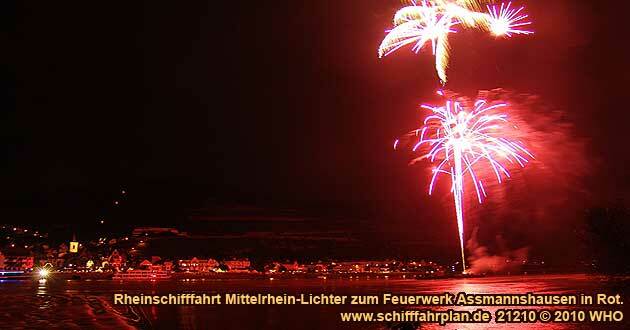 The firework can be seen from the open air deck. Boat tickets from 34 EUR. 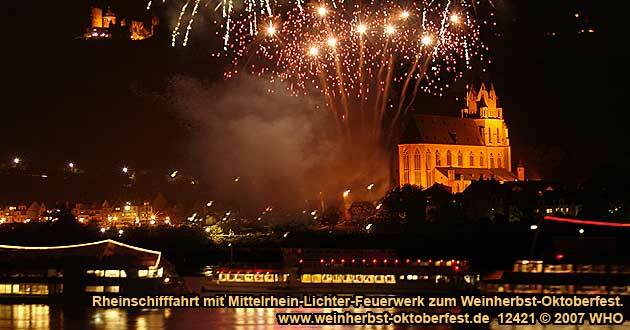 through the World Heritage "Upper Middle Rhine River Valley" with board party, DJ music and dance on a party boat. Golden wine autumn and Swimming Federweisser vintage festival on board with Federweisser (fermenting wine), onion tarts (pre-order necessary), wine from the Middle Rhine River, draught beer and non-alcoholic beverages. The firework can be seen from the open air deck. Boat tickets from 28 EUR. If you would like to charter an extra boat for your company outing, or if you want to request a group rate for groups from 15 people, please use this group rate online form.